Royal Wheels India is an adventure travel group organising Periyar National Park Tour Package in India. Set high in the ranges of the Western Ghats, in God's Own Country, Kerala, is the Periyar National Park and Tiger Reserve. Periyar wildlife sanctuary has a picturesque lake at the heart of the sanctuary. Formed with the building of a dam in 1895, this reservoir meanders around the contours of the wooded hills, providing a permanent source of water for the local wildlife. Though its a Tiger Reserve, tourists come here to view the Indian elephants in the act of ablution and playfulness by the Periyar lake. Apart from Elephants, the other animals to be seen in the Periyar sanctuary are Gaur, Wild Pigs, Sambar, Barking Deer, Mouse Deer, Dole or Indian Wild Dog and very rarely, a Tiger. There are, now, an estimated 40 tigers here. Four species of primates are found at Periyar - the rare lion-tailed macaque, the Nilgiri Langur, Common Langur And Bonnet Macaque. 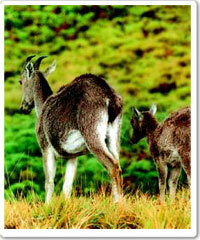 Periyar also happens to be the habitat of the elusive Nilgiri Tahr, which is rarely to be seen. Kumily : Situated just 4-kms from Periyar, Kumily is a growing town where tourism is fastly catching up just like the spice trade, the major occupation of this small town. The town is also well equipped with the excellent hotels and resorts for accommodation. Cradomom Hills : Periyar and Kumily are the most convenient points from which visitors can easily explore Kerala's beautiful Cardamom hills. Guide will approach you at offers of trips via jeep or taxi to the hills and if you can get a group together, these trips work out as a good travel value. Boat Cruises : Boat cruises make the best option to check out the wilds of Periyar Sanctuary.Today the Periyar lake presents an excellent boating spot for tourists. Although it is unusual to see many animals from the boats, still you spot a family of Elephants, Wild Boar, and Sambar Deer by the water's edge. The upper deck is best for wildlife viewing when taking a boat cruise, but better turn up half an hour early to get the best seat. To maximise you chances, take the 7.00 am boat. You can also consider renting your own boat. For further information contact : Field Director, Project Tiger,Kanjikuzhi, Kottayam, Kerala. Arrive at noon at the resort in Periyar. Enjoy a afternoon boat ride in Periyar lake for wildlife viewing. Overnight in the resort. Enjoy a morning boat ride for elephant tracking and bird watching. One can also indulge in wildlife photography over here. 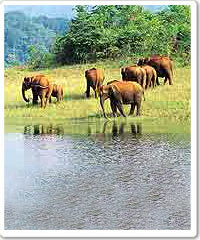 The visit to the Periyar National Park lasts for about three hours. Return back to the resort for having breakfast & lunch. You can also opt for taking up a forest trail and explore the Periyar park surroundings or bird-watch. Afternoon boat ride for wildlife viewing. Overnight stay at the resort in Periyar. Fly Delhi-Bangalore in the morning. Arrive Bangalore and transfer to Mysore (125 km / 3 hr.). Guided tour of Mysore visiting Brindaban gardens and Mysore palace. Overnuse, Qutab Minar & Humayun's tomb. Overnight at the hotel. Transfer to Nagarhole National Park (80 km / 2 1/2 hr.). Afternoon wildlife viewing in jeeps. Overnight at the wildlife lodge. 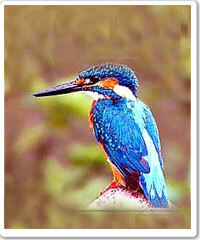 Morning wildlife viewing and birding in the park or a Coracle ride on the Kabini river. Evening drive / elephant ride into the jungle. Overnight at the wildlife lodge. Drive to B R Hills (6 hr.). Afternoon trek in B R Hills for nature watch. Overnight stay. Morning and evening wildlife viewing and birding. Overnight stay in tents in K Gudi Camp. Morning departure to Bandipur (4hr.). Arrive for lunch at the resort. Afternoon visit to the wildlife sanctuary in jeeps. Overnight stay. Morning & evening wildlife viewing and birding. Overnight stay in the resort. Early morning drive to Ooty (80 km / 3 hr.). Arrive Ooty in the afternoon. Rest of the day at leisure. Overnight stay in the resort. Drive to Munnar. Afternoon drive to Eravikulam National Park to see Nilgiri Thar. Overnight stay in the resort. Morning visit to the park for wildlife and birding. Drive to Periyar in the afternoon (3 hr.). Overnight stay in the resort. Morning and evening boat cruise to see elephants or go birding. Overnight stay in the resort. Drive to Kumarakom in the morning (5 hr.) Arrive Kumarakom in the afternoon. Rest of the day at leisure. Overnight at the resort. Morning backwater cruise and evening visit to the bird sanctuary. Overnight at the resort. Drive to Cochin (3 hr.). Full day guided tour of Cochin. Transfer to the airport for onward journey.